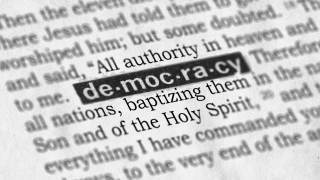 In a three-part series, Dr Joe Boot (Wilberforce Academy, Ezra Institute for Contemporary Christianity) argues that liberal democracy – the dominant view in political philosophy - is a form of heresy springing from beliefs that should not be held by Christians. In part one, Dr Boot looks at authority – what is a Christian understanding of knowledge and how does it help us assess differing views of political life? The inescapable question that confronts us in every aspect of life is the question of authority. Whom and what will we believe, how will we live, and by what standard? There are a variety of ways we come to know and believe, and there are various activities by which we arrive at our convictions and acknowledge authority. One human activity giving rise to a certain kind of authority is that of science. There are numerous sciences – the natural sciences, medical sciences, operational sciences, not to mention what are often referred to today as social sciences, examining things like anthropology, archaeology, economics, history, human geography, jurisprudence, linguistics, psychology, sociology and political science. Theology is an important science where we examine Scripture and the creeds and confessions of the church, to deepen our understanding and insight into them. When certain individuals have spent much time studying a given area, reaching a certain degree of competence, they may establish themselves as an ‘authority’ in their field. However, when a Christian reads the Bible, prays, or sings the Psalms to meditate on God’s Word and engage in worship, it is not a scientific enterprise. The act of believing the Word of God is different from scientific analysis of biblical languages, for example. Moreover, when we live by the Word of God given in creation and His Word revelation, we do not establish its authority, but acknowledge and trust it. Nonetheless, there is a deep connection between our believing activity and the analytical conclusions we reach in any of these areas we now call the sciences. This connection is critical. Both historically and in terms of the structure of our thought as human beings, all our scientific or theoretical knowledge is preceded by a more original, primary knowledge. This is the everyday knowledge of experience, of practical, factual, full and ordinary life in created reality which deepens and grows with time – it is the experience of being human in God’s world. In this everyday knowledge we encounter norms like good and evil, and come upon the laws of God for creation in every aspect of living. One does not need to be a physicist, for example, to discern a law that causes objects to fall to the ground. We ‘know’ this reality regardless of whether we can formulate the law of gravity symbolically on a whiteboard. The root of this primary knowledge is a kind of basic trust that is necessary for every other kind of knowledge to be established. All other forms of secondary knowledge must presuppose this basic trust – without it there could be no science. This trust rests on a fundamental kind of faith knowledge, or what we might call religious knowledge that is inescapable to human beings as created, religious creatures. This knowledge can be supressed and distorted, but it cannot be escaped. The danger in every area of human thought is that people can start to believe and trust in what a given theoretical activity of science says, and so elevate a secondary, provisional form of knowing to the place of the primary knowledge in their lives. In other words, their faith subtly shifts from God to man, from revelation to scientific theories, from basic trust in God’s created reality and Word, to human abstractions. This is not to say that human theoretical knowledge is not very important. The sciences as a tool have the capacity to deepen our understanding of a given area of life, but they cannot displace created reality or revelation, remake the world, or provide primary knowledge – they are a fallible and secondary instrument. Final authority resides only in the Author of all creation, who places human beings in his creation, made in his image, and subject to his law-Word for all things. This is no less true in biology and history than in political science or theology. This foundational understanding of the relationship of the sciences (various fields of knowledge and inquiry) to belief and revelation is vitally important when considering the problem of heresy, because the heretic is one who seeks to establish independent authority rather than acknowledge it. Here, a secondary form of knowledge acquisition – based in personal theorising and revising of accepted Christian doctrine – replaces the primary knowledge of revelation to be confessed and believed.The word heresy comes from a Greek word (hairesis), the essential meaning of which is a taking or choosing for oneself. The heretic is one who, in their belief, confession or teaching, has placed their personal, eccentric choice or opinion above that of accepted and received authority: ultimately, the authority of God and His Word. That is why a person engaged even in the science of theology (a discipline with as many pitfalls as biology) must take great care not to confuse their novel opinion with authority, or primary knowledge. Which is to say, theological concepts and systems are not identical to Scripture. They must be weighed against Scripture and the testimony of the Church down the centuries from the time of the apostles. When theologians have conflated their novel ideas with Scripture itself – with biblical authority – the propagation of heresy is the end result. The faith knowledge of the heart variously given with creation – manifest in Christ, inscripturated in the Older and Newer Testaments, confirmed by the Holy Spirit and concretised by the confessing orthodox church down the centuries – is primary knowledge,while theological systems and conceptual models – though vital and helpful in deepening our understanding – are secondary forms of scientific knowledge, provisional and always in reform. Heresy then, is essentially false teaching which clearly contravenes the biblical Word and orthodox deposit of faith, denying their binding authority. The early church was found almost immediately battling heretical ideas, arising from creative theologies that sought to fuse Christianity with forms of paganism. Several of the most important creeds of the church were the product of that battle for a faithful reception of legitimate authority, rooted in Christ and his Word. Notice that these two foundational ecumenical creeds, which summarise the basic teaching of Scripture, affirm that the triune God is almighty and the creator of all things; that Jesus Christ is Lord and God and the judge of all. In short, they affirm the sovereignty and Lordship of Jesus Christ. To deny this Lordship and sovereignty to Christ is therefore heretical. Typically, when Christians consider the subject of heresy, we invariably think of church councils, ecclesiastical tribunals and church order; we regard these matters of doctrine as essentially confined to the church institute. After all, what relevance could a person’s rejection of God’s sovereignty, or Christ’s atoning death for sin have on political life, for example? Without doubt, these church-oriented considerations are vitally important for understanding and addressing heresy. The church must confront heretical teaching, refute it, and discipline members. But what we rarely consider are the implications of heretical ideas and teaching as they impinge upon life outside the institutional church. This oversight is serious because if we ecclesiasticise the concept of heresy and regard it as having relevance only for the life of the church, we will fail to see how heretical thought profoundly affects other vitally important areas of life – including the political. In fact, what we believe about God’s sovereignty actually has far-reaching implications for political life and thought! It is evident that there are times when heretical thinking is only clearly brought to light outside the ecclesiastical sphere. Because of the tendency among Christians today to acquiesce to secularism’s radical dualism – a way of thinking which divides faith and reason, private and public, religion and politics, into separate storeys of reality as though they were hermetically sealed domains – one foundational truth about reality can supposedly bear authority in the church institute (a supposedly ‘private’ sphere of religion), whilst a contrary commitment can hold, at the same time, for cultural and political life (the ‘public’ sphere of reason). Because of this latent dualism, it is possible for this contradiction to persist without the Christian ever clearly recognising a basic incoherence. This means that a Christian within the confessing church community may believe themselves to be essentially orthodox as far as the fundamental tenets of the faith are concerned (in the ‘religious’ sphere) yet hold, at the same time, to a radical liberal-democratic or even Marxist view of cultural and political life for the public space. They may even suggest to fellow believers that the acceptance of ‘alternative lifestyles’ and the redefinition of marriage is a good thing for ‘society out there.’ In these instances, arising either from ignorance or an arrogant setting aside of Scripture, heretical views of God which deny His total sovereignty in all of life have manifested themselves in areas outside the church institute (where they have remained quietly hidden), because inside the church institute God is ‘permitted’ to be sovereign. This pervasive influence of heresy is inevitable. Because faith-knowledge and religious presuppositions are the point of departure for every area of life and thought – not just in the church or the science of theology – heresy never confines its influence or application within the ecclesiastical sphere. Very often as a result, Christians who are inconsistent in their thinking and lack a comprehensive biblical worldview can unwittingly adopt views and practices in other areas of life that are rooted in heresy. In short, Christians frequently adopt heretical political theologies and even humanistic ideologies as suitable for the life of society, sometimes without ever realising they are in denial of fundamental confessional truths of Scripture and the creeds. 1. Egbert Schuurman, “Creation and Science: Fundamental Questions Concerning Evolutionism and Creationism,” The Reformed Ecumenical Synod,Vol. VIII, No.2, August 1980, Edited by Paul G. Schrotenboer.